I’m in love with a donkey. I find myself quoting him to others. I’m savoring his book. 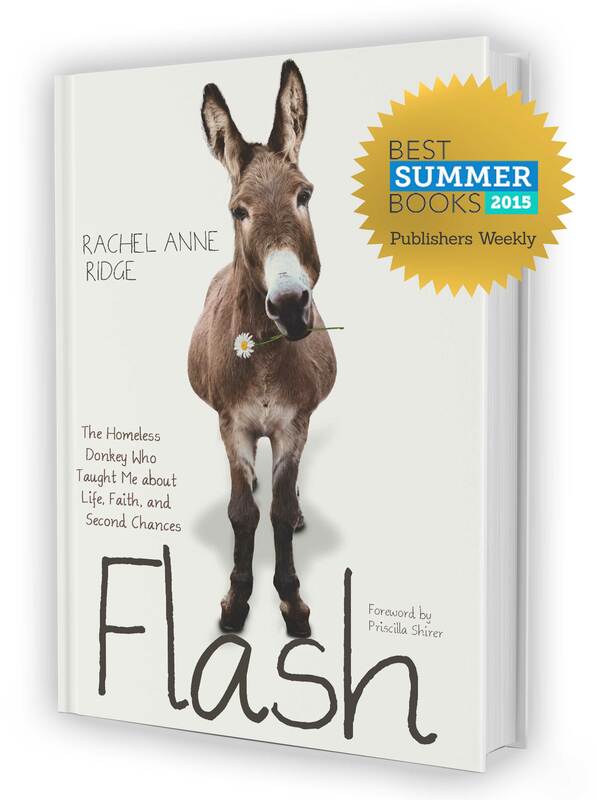 FLASH: The Homeless Donkey Who Taught Me About Life, Faith, and Second Chances by Rachel Anne Ridge is a fabulous book. Rachel and her family were struggling to make ends meet in a crashing economy when a stray donkey showed up in their driveway. He soon wormed his way into their hearts and lives and barn. The book is a collection of short essays about Flash’s life with the Ridge family. Rachel is a gifted artist who also writes lovely prose. (I’m so jealous. I can write but I’m not an artist, at all.) She tells a story about Flash and one of his adventures then makes an application to her own life, and to mine as well. I’ve been “friends” with Flash on social media for awhile and had made a mental note to buy the book when it came out, but it arrived all by itself on release day, a lovely gift from an even lovelier friend. I love Flash’s adventures. So does Stud Muffin. My back was turned one day for an instant and he snagged the book and took it outside to read. He read all day. I finally got it back and I’d intended to read all day so I could be finished with it if it “disappeared” again. But I found that I really enjoy reading this one slowly. A chapter or two a day is a good pace. I let Flash’s adventures and lessons settle a bit more deeply in my heart than if I was reading to get to the end. This is a great book and I highly recommend it. You can follow Flash on Twitter here.